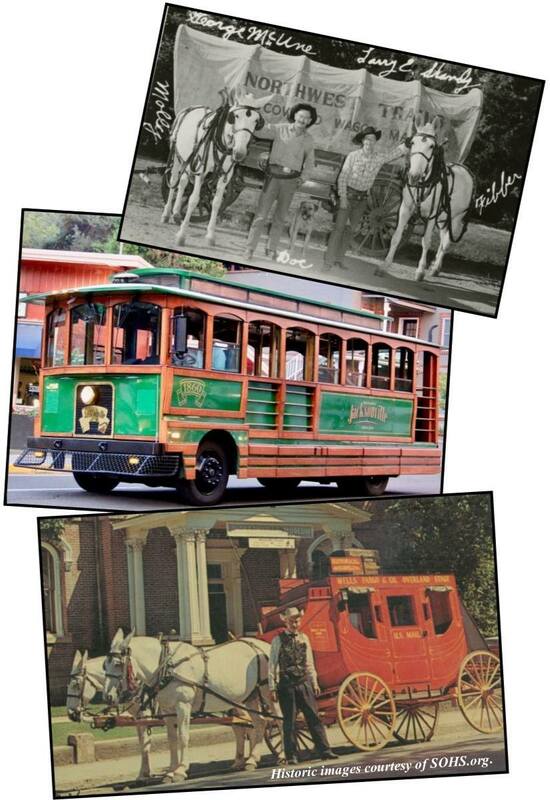 Stagecoach | Historic Jacksonville, Inc.
Before the Jacksonville Trolley began offering narrated history tours, visitors and residents alike could board a stagecoach operated by George McUne for a 15-minute tour of the town. After traveling in a covered wagon from Independence, Missouri, to Oregon as part of Oregon’s 1959 Centennial Wagon Train, McUne had sent to the Smithsonian for original Wells Fargo stagecoach plans and handcrafted a replica. In 1961, he began offering stagecoach tours of Jacksonville. The coach carried 12 to 15 passengers and was drawn by his reliable mules, Fibber and Molly. McUne would share stories about the discovery of gold, President Hayes’ visit to Jacksonville, the West’s last great train robbery, and other local tales. And tours always included a robbery at the Beekman Bank. McUne’s stagecoach rides were the genesis of what became Jacksonville’s original Pioneer Village with its array of “rescued” historic buildings and its multiple attractions.